Turns out I am a bit of a sucker for a pretty dress and tights when it comes to dressing Lottie. 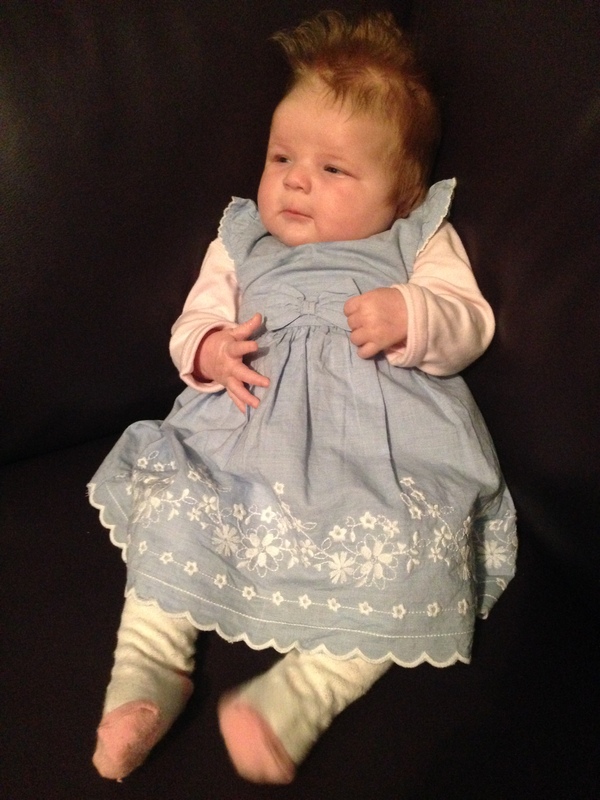 I do try to dress her in funky outfits too, but there is something so cute about a traditional dress on a baby girl. So this week’s peek into Lottie’s wardrobe is just that – a little pale denim dress with the prettiest embroidered flowers along the hemline, teamed with a simple long-sleeved vest and tights. Dress, George at Asda – £8, Vest, from a set of five, Matalan, Tights, part of a set from Sainsburys. And talking of traditional, we have had another absolutely gorgeous cardigan given to us by the mum of one of my friends. People are so kind with babies, she has knitted Lottie three now and they are all stunning. The latest is a bobbly stripy design. I wish I had time to knew how to knit. These are money can’t buy clothes. 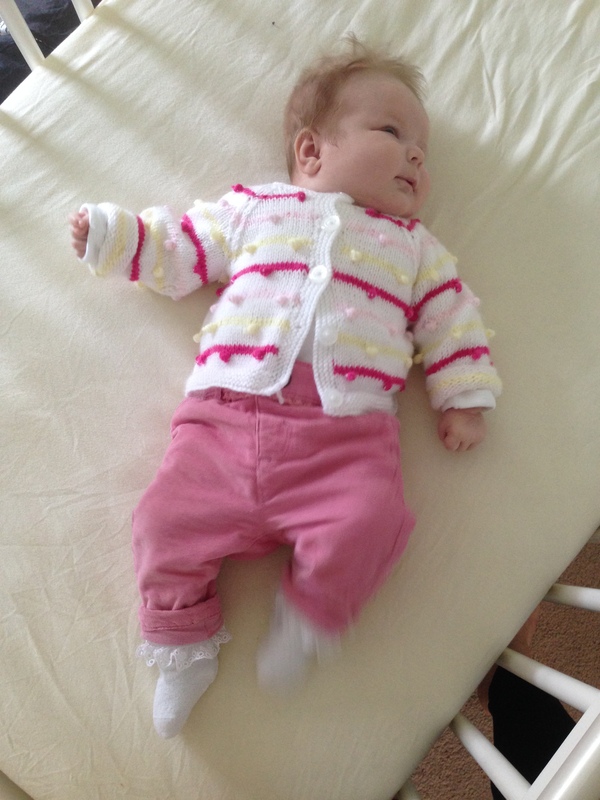 Cardigan, homemade; Pink cord trousers, Next, £8.50, Socks, from a pack of three, Next, £5. And it would be rude to let this little pumpkin from George at Asda go without a mention. Although Lottie doesn’t look quite as keen on it as I was! How cute! I have a serious urge to have a girl now! 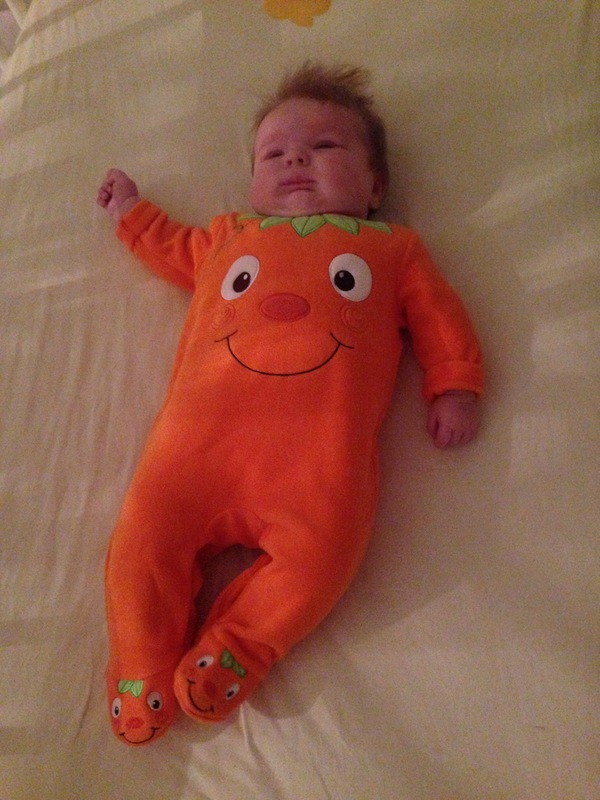 Aww look at the little pumpkin outfit, so adorable! I agree with you, little girls in dresses look amazing and so cute. I agree with you re the dress & tights, they look the cutest in that kind of outfit. We sell so many amazing baby dresses in work it is really difficult to leave without taking them home! Ooh I bet the temptation is too much!